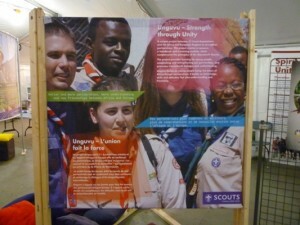 The Africa and European Regions have been showcasing the Unguvu Project at the Global Development Village. Over the last 8 days we have ran 12 workshops for 36 Scout patrols from 21 countries. The workshop focused on the skills needed for working together: teamwork, intercultural understanding, communication and trust as well as focusing on the need for equal partnerships. 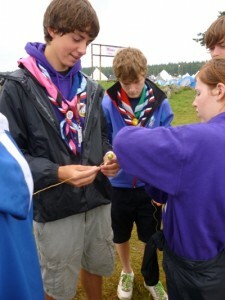 The Scouts came away realising that working together across cultures is fun, possible and worthwhile, even if it is not easy. We also had an interactive stand at the GDV and a banner in the World Scout Centre to further showcase Unguvu. The Jamboree also provided an opportunity for the current and prospective partners of the “Unguvu Coalition” to meet. We were kindly hosted by in the French Foodhouse. The meeting allowed the partners to take stock of where we are and how we need to further develop Unguvu so that we make the most of the tools produced during this year. Over the coming months it has been agreed to plan both for the multiplying of the current project and a future European Commission application in 2012.